Few weeks back, we reported how a string of just 13 characters could cause your tab in Chrome to crash instantly. However, there was an exception that this special 13 characters string was only working on Mac OS X computers with no impact on Windows, Android, or iOS operating systems. Now, a recent hack against Chrome browser could crash your Chrome version 41 and above for Mac OS X, Windows and Chrome OS. At the time of writing, Chrome 41 seems to crash on long and/or malformed URLs. 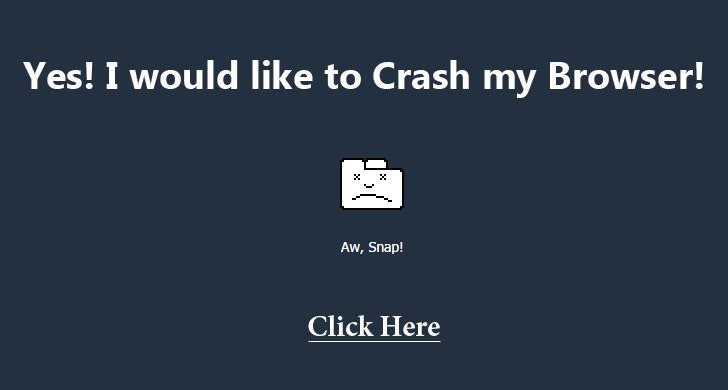 The details of this crash bug, dubbed as AwSnap, is described on Github. Warning: DO NOT CLICK on this LINK, which actually points to a Reddit thread that crashes Chrome browser because a Reddit user-submitted post containing the crash content. Just like a post, crashing a thread via a comment is also possible. Chrome crash occurs only when accessing the long and/or malformed URLs through a web server, which means using file:// will not crash your Chrome browser. The crash issue appears to be small but is really serious, as it is possible for anyone to post the malformed URLs on a discussion forum, such as Reddit, and make the thread unavailable to all users. So, we recommend our users to do not post or drop the malformed URLs in comments or on your Facebook timeline. At the time of writing, the AwSnap bug has been confirmed in Chrome 41 and patched in Chrome 42, & 43 running on MacOS, Windows and Chrome OS. However, there are mixed reports on Ubuntu.